Those who knew and worked with the senator remember their first impressions of him. The showers were cold at Carleton College 37 years ago. The bathrooms were dirty and the cafeteria was spooning out chow on paper plates. Local 34 of the International Union of Operating Engineers — cafeteria and campus maintenance workers — was on strike in the autumn of 1980. But college rules prohibited strikers from picketing on campus. So political science Prof. Paul Wellstone stepped in — brandishing an “ON STRIKE, PLEASE STAY AWAY” placard on the steps of Carleton’s administration building in Northfield. Wednesday marks 15 years since Wellstone’s death and, no doubt, people will remember where they were when they first heard about his plane crashing near Eveleth, Minn.
State Rep. Frank Hornstein, DFL-Minneapolis, also went to Macalester and first heard about the fiery Carleton prof from Smith that fall. Two years later, Hornstein was a young community organizer for Minnesota COACT — the state’s longest-running grass-roots citizens’ action group. Hornstein first met Wellstone, who was running for state auditor in 1982, at the now-defunct Rainbow Cafe on Hennepin Avenue and Lake Street in Minneapolis. “When Paul asked me, and all the young organizers, to help him out it was weird in a number of ways,” s aid Hornstein. “When you’re 21, who trusts someone running for elected office?” But if I’m elected auditor, Wellstone explained, I’ll be on the state investment board and we can cut ties with South Africa’s racist rule. So Hornstein signed up to help Wellstone’s auditor campaign — which would earn 45 percent of the vote; not enough to beat future Minnesota Republican Gov. Arne Carlson. “Today we have sophisticated printouts with likely voters’ ages, voting history and party affiliation so we know who to target,” Hornstein said. “We had nothing like that in 1982. We’d knock on doors in the Powderhorn neighborhood and ask: ‘Have you made up your mind up on the auditor’s race?’ And people would say, ‘Huh?’ ’’ Eight years later, Wellstone was elected to his first of two U.S. Senate terms. Polls showed him leading the race for a third term when his plane went down 12 days before Election Day, 2002. Sam and Sylvia Kaplan, longtime financial backers of progressive candidates in Minnesota DFL circles, were supporting their neighbor, former state Rep. Todd Otis, early in the 1990 contest to challenge U.S. Sen. Rudy Boschwitz. The Kaplans’ longtime friend Arthur Himmelman urged them to meet Wellstone. They reluctantly agreed to gather in Sam Kaplan’s law office on the 55th floor of a Minneapolis skyscraper. “We didn’t want to hurt Arthur’s feelings,” Sylvia said, adding that Wellstone was considered a “noisy, unimpressive nuisance” who had been hanging around the DFL fringes. She arrived at the office tower just as Wellstone showed up and they rode the elevator together. Wide-eyed, Wellstone gleamed at the surroundings and then wowed the Kaplans. “He instantly connected with us like a jazz musician on a riff,” Sylvia said. “You’d say something and he’d respond. He later joked that he knew once he had me, he had Sam and he was right.” Sam Kaplan went on to serve as Wellstone’s finance and campaign chairman and, later, as President Barack Obama’s ambassador to Morocco. 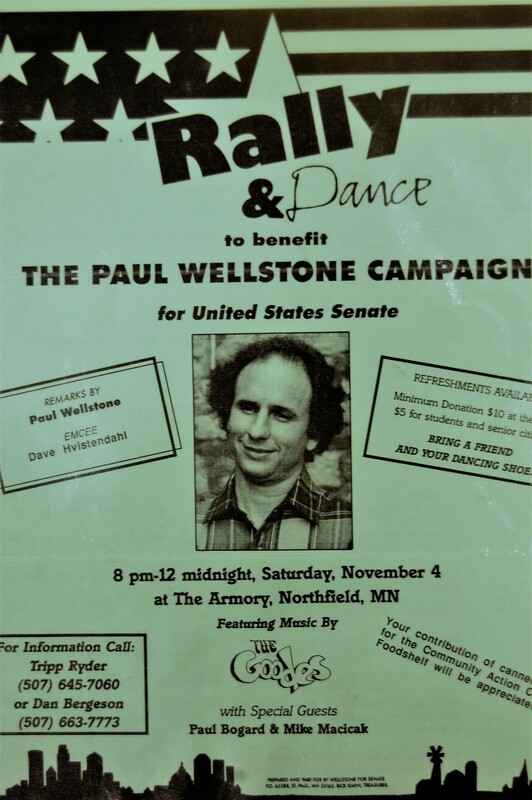 Wellstone must have felt a kinship with those protesters 22 years after he picketed for Carleton cafeteria workers. After all, Wellstone’s mother, Minnie, was a cafeteria worker herself who emigrated from Russia. Wellstone’s father, Leon, was also a Jewish immigrant who left Russia after Bolshevik purges killed Wellstone’s grandparents. At 16, Wellstone met Sheila Ison on the Maryland shore, and the high school sweethearts married in 1963. They were together nearly 40 years later when the plane crashed — killing them along with their daughter, Marcia, three campaign workers and two pilots.